Moncada went 2-for-4 with two solo home runs Tuesday against the Royals. Moncada took Jorge Lopez deep for both of his homers, increasing his total on the campaign to five. He's hit well in the early going and has recorded at least one hit in six of his last seven games, including three multi-hit efforts. 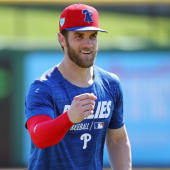 Most encouragingly, his 24.3 percent strikeout rate is nearly 10 percentage points lower than his mark from last season.